"Xian" redirects here. For other uses, see Xian (disambiguation). For the Dowager Empress China, see Ci'an. Xi'an (/ʃjɑːn/ SHYAHN, also UK: /ˌʃiːˈæn/ shee-AN, US: /ˌʃiːˈɑːn/ shee-AHN, Chinese: [ɕí.án] ( listen)) is the capital of Shaanxi Province, China. A sub-provincial city on the Guanzhong Plain in northwestern China, it is one of the oldest cities in China, and the oldest of the Four Great Ancient Capitals, having held the position under several of the most important dynasties in Chinese history, including Western Zhou, Qin, Western Han, Sui, and Tang. Xi'an is the starting point of the Silk Road and home to the Terracotta Army of Emperor Qin Shi Huang. Since the 1990s, as part of the economic revival of inland China especially for the central and northwest regions, the city of Xi'an has re-emerged as an important cultural, industrial and educational centre of the central-northwest region, with facilities for research and development, national security and space exploration. Xi'an currently holds sub-provincial status, administering 9 districts and 4 counties. As of 2018[update] Xi'an has a population of 12,005,600, and the Xi'an–Xianyang metropolitan area a population of 12.9 million. It is the most populous city in Northwest China, as well as one of the three most populous cities in Western China, the other two are Chongqing and Chengdu. In 2012, it was named as one of the 13 emerging megacities, or megalopolises, in China. "Xi'an" is the atonal pinyin romanization of the Mandarin pronunciation of its name 西安, which means "Western Peace". (The apostrophe- known in Chinese as a 隔音符號, géyīn fúhào- should be included to distinguish its pronunciation from the single syllable xian.) The name was adopted in 1369 under the early Ming dynasty. Jesuit missionaries recorded its name as "Si-ngan" or "Si-ngan-fou" from its status as the seat of a prefecture (府, fǔ). This form still appears in the Latin name of the Catholic diocese of Xi'an, archidioecesis Singanensis. The name was later romanized as "Hsi-an" by Wade & Giles and as "Sianfu" or "Sian" by the Qing imperial post office, both of which were common until the general adoption of pinyin. Xi'an currently does not have a widely accepted one-character abbreviation as many other Chinese cities do. Its license plates are simply marked with 陕A, based on the name of its province. Xi'an has a rich and culturally significant history. The Lantian Man was discovered in 1963 in Lantian County, 50 km (31 mi) southeast of Xi'an, and dates back to at least 500,000 years before the present time. A 6,500-year-old Neolithic village, Banpo, was discovered in 1953 on the eastern outskirts of the city proper, which contains the remains of several well organized Neolithic settlements carbon dated to 5600–6700 years ago. The site is now home to the Xi'an Banpo Museum, built in 1957 to preserve the archaeological collection. Xi'an became a cultural and political centre of China in the 11th century BC with the founding of the Zhou dynasty. The capital of Zhou was established in the twin settlements of Fengjing (丰京) and Haojing, together known as Fenghao, located southwest of contemporary Xi'an. The settlement was also known as Zhōngzhōu to indicate its role as the capital of the vassal states. In 770 BC, the capital was moved to Luoyang due to political unrest. Terracotta Army inside the Qin Shi Huang Mausoleum, 3rd century BC. Following the Warring States period, China was unified under the Qin dynasty (221–206 BC) for the first time, with the capital located at Xianyang, just northwest of modern Xi'an. The first emperor of China, Qin Shi Huang ordered the construction of the Terracotta Army and his mausoleum just to the east of Xi'an almost immediately after his ascension to the throne. In 202 BC, the founding emperor Liu Bang of the Han dynasty established his capital in Chang'an County; his first palace, Changle Palace (長樂宮, "Perpetual Happiness") was built across the river from the ruin of the Qin capital. This is traditionally regarded as the founding date of Chang'an. Two years later, Liu Bang built Weiyang Palace (未央宮, "Never Ending Palace") north of modern Xi'an. Weiyang Palace was the largest palace ever built on Earth, covering 4.8 square kilometres (1,200 acres), which is 6.7 times the size of the current Forbidden City and 11 times the size of the Vatican City. The original Xi'an city wall was started in 194 BC and took 4 years to finish. Upon completion, the wall measured 25.7 km (15.97 mi) in length and 12 to 16 m (39.37–52.49 ft) in thickness at the base, enclosing an area of 36 km2 (13.90 sq mi). In the year 190, amidst uprisings and rebellions just prior to the Three Kingdoms Period, a powerful warlord named Dong Zhuo moved the court from Luoyang to Chang'an in a bid to avoid a coalition of other powerful warlords against him. Following several hundred years of unrest, the Sui dynasty united China again in 582. The emperor of Sui ordered a new capital to be built southeast of the Han capital, called Daxing. It consisted of three sections: the Imperial City, the palace section, and the civilian section, with a total area of 84 km2 (32 sq mi) within the city walls. At the time, it was the largest city in the world. The city was renamed Chang'an by the Tang dynasty. In the mid-7th century, after returning from his pilgrimage to India, the Buddhist monk Xuanzang established a translation centre for Sanskrit scriptures. Construction of the Giant Wild Goose Pagoda began in 652. This pagoda was 64 m (209.97 ft) in height, and was built to store the translations of Buddhist sutras obtained from India by Xuanzang. In 707, construction of the Small Wild Goose Pagoda began. This pagoda measured 45 m (147.64 ft) tall at the time of completion, and was built to store the translations of Buddhist sutras by Yijing. The massive 1556 Shaanxi earthquake eventually damaged the tower and reduced its height to 43.4 m (142.39 ft). The Nestorian Stele is a Tang Chinese stele erected in 781 that documents 150 years of early Christianity in China. It is a 279 cm tall limestone block with text in both Chinese and Syriac describing the existence of Christian communities in several cities in northern China. It reveals that the initial Nestorian Christian church had met recognition by the Tang Emperor Taizong, due to efforts of the Christian missionary Alopen in 635. Chang'an was devastated at the end of the Tang dynasty in 904. Residents were forced to move to the new capital city in Luoyang. Only a small area in the city continued to be occupied thereafter. During the Ming dynasty, a new wall was constructed in 1370 and remains intact to this day. The wall measures 11.9 km (7.4 mi) in circumference, 12 m (39.37 ft) in height, and 15 to 18 m (49.21–59.06 ft) in thickness at the base; a moat was also built outside the walls. The new wall and moat would protect a much smaller city of 12 km2 (4.6 sq mi). In October 1911, during the revolution in which the Qing dynasty was overthrown, Xinhai forced counter-attacked and slaughtered some 20,000 Manchus, therefore they successfully liquidated the entire population of Manchus of the city. A British missionary who witnessed the massacre commented that "Old and young, men and women, children alike, were all butchered... Houses were plundered and then burnt; those who would fain have laid hidden till the storm was past, were forced to come out into the open. The revolutionaries, protected by a parapet of the wall, poured a heavy, unceasing, relentless fire into the doomed Tartar (Manchu) city, those who tried to escape thence into the Chinese city were cut down as they emerged from the gates." In 1936, the Xi'an Incident took place inside the city during the Chinese Civil War. The incident brought the Kuomintang (KMT) and Communist Party of China to a truce in order to concentrate on fighting against the Japanese Invasion. On May 20, 1949, the Communist-controlled People's Liberation Army captured the city of Xi'an from the Kuomintang force. Xi'an made headlines for being one of the many cities where the 2012 China anti-Japanese demonstrations occurred. 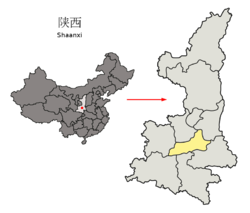 Xi'an lies on the Guanzhong Plain in the south-central part of Shaanxi province, on a flood plain created by the eight surrounding rivers and streams. The city has an average elevation of 400 metres (1,312 ft) above sea level and an annual precipitation of 553 mm (21.8 in). The urban area of Xi'an is located at 34°16′N 108°56′E﻿ / ﻿34.267°N 108.933°E﻿ / 34.267; 108.933. The Wei River provides potable water to the city. The city borders the northern foot of the Qin Mountains (Qinling) to the south, and the banks of the Wei River to the north. Hua Shan, one of the five sacred Taoist mountains, is located 100 km (62 mi) away to the east of the city. Not far to the north is the Loess Plateau. At the beginning of Han dynasty, Prime Minister Zhang Liang advised the emperor Liu Bang to choose Guanzhong as the capital of the Han dynasty: 'Guanzhong Plain, which is located behind Xiao Pass and Hangu Pass, connects Long (Gansu) and Shu (Sichuan). Lands of thousand miles rich in harvest be found here, as if this place belongs to the nation of heaven.' (关中左崤函，右陇蜀，沃野千里，此所谓金城千里，天府之国也) Since then, Guanzhong is also known as the 'Nation of the Heaven'. Xi'an has a temperate climate that is influenced by the East Asian monsoon, classified under the Köppen climate classification as situated on the borderline between a semi-arid climate (BSk) and humid subtropical climate (Cwa). The Wei River valley is characterised by hot, humid summers, cold, dry winters, and dry springs and autumns. Most of the annual precipitation is delivered from July to late October. Snow occasionally falls in winter but rarely settles for long. Dust storms often occur during March and April as the city rapidly warms up. Summer months also experience frequent but short thunderstorms. The monthly 24-hour average temperature ranges from around the freezing mark in January to 27.0 °C (80.6 °F) in July, with an annual mean of 14.08 °C (57.3 °F). With monthly percent possible sunshine ranging from 31 percent in December to 47 percent in August, the city receives 1,536 hours of bright sunshine annually. Extremes since 1951 have ranged from −20.6 °C (−5 °F) on January 11, 1955 to 41.8 °C (107 °F) on June 21, 1998. A highest record of 42.9 °C (109 °F) was registered in another station on June 17, 2006. The Shaanxi Astronomical Observatory was established in 1966. In 1975, according to the Geodetic Origin Report of the People's Republic of China, 'in order to avoid bias in the mensuration as much as possible, the Geodetic Origin would be in central mainland China.' Lintong (临潼), a town near Xi'an was chosen. Since 1986, Chinese Standard Time (CST) was set from NTSC. The NTSC in Lintong is 36 km (22 mi) away from Xi'an. National Time Service Centre (NTSC), the Chinese Academy of Sciences is an institute which is mainly engaged in the service and research on time and frequency. NTSC takes charge of generating and maintaining the national standard time scale, disseminating the time and frequency signals. The autonomous standard time scales of universal time and atomic time and the dissemination techniques with LF radio and HF radio were established successively during the 1970s and 1980s, which meet all the requirements for different applications on the whole, such as the scientific researches, national economy, etc. As of 2015[update] Xi'an has a population of 8.7 million. Compared to the census data from 2000, the population has increased by 656,700 persons from 7.41 million. The population is 51.66 percent male and 48.34 percent female. Among its districts, Yanta has the largest population, with 1.08 million inhabitants. 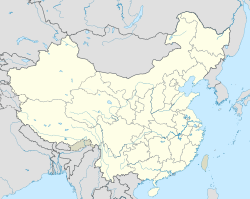 The encompassing Xi'an-Xianyang metropolitan area was estimated by the OECD (Organisation for Economic Co-operation and Development) to have, as of 2010[update], a population of 12.9 million, and locally as 13,569,700,[failed verification] of which 5,740,000 is urban. The majority of Xi'an residents are Han Chinese, who make up 99.1 percent of the city's total population. There are around 81,500 people belonging to ethnic minorities living in Xi'an, including 50,000 Hui people. During World War II, Xi'an became a destination for many refugees from other provinces of China, especially neighboring Henan Province. Because Xi'an was far inland, the invading Japanese army only managed a few aerial assaults on the city. As a result, Xi'an suffered minimal destruction. After 1949, the national government tried to balance the development in different regions of China, and relocated a number of factories and universities from other cities to Xi'an. Modern Xi'an Jiaotong University was relocated from its original campus in Shanghai. Xi'an has many areas that are easily accessible on foot. In many commercial, residential, educational zones in the city, especially in the shopping and entertainment districts around the Bell Tower, underpasses and overpasses have been built for the safety and convenience of pedestrians. Electric bikes are popular among students and offer easy transportation in and around the city for many residents. A bicycle-sharing network started operating in 2013 and today has 52,000 bikes, used by over 200,000 people per day. Taxi services are numerous, but many citizens of Xi'an still commute to work using the city's 270 official municipal bus routes serviced by a fleet of over 7,800 buses, with an average system-wide ridership of over 4 million people per day. The bus network is complemented by a rapidlly expanding subway system that carries over 1.5 million commuters per day. There are more than 2 million registered automobiles in Xi'an; the growing number of personal automobiles also means traffic jams are a common urban issue. Line 2, running through the city from north (North Railway Station) to south (Weiqu Nan), was the first line opened to the public on September 16, 2011. Operations began on September 28, 2011. This line is 19.9 kilometres (12.4 miles) long with 17 stations. Line 1 opened on September 15, 2013. As a west-east railway, its 19 stations connect Houweizhai and Fangzhicheng. Line 3 runs from northeast (Baoshuiqu) to southwest (Yuhuazhai) and opened on November 8, 2016. Line 4, which is basically parallel to Line 2 on its east, runs from the North Square of the North Railway Station [Beikezhan (Beiguangchang)] to south (Hangtianxincheng) and was available publicly on December 26, 2018. Eight lines are planned to be finished around 2021. It will mainly service the urban and suburban districts of Xi'an municipality and part of nearby Xianyang City. The subway system covers some of the most famous attractions, such as Banpo Museum (Banpo Station, Line 1), Bell and Drum Tower (Line 2), Fortifications of Xi'an (Line 2), the Giant Wild Goose Pagoda (Line 3 and Line 4), the Daminggong National Heritage Park (Line 4) and Shaanxi History Museum (Line 2, 3 and 4), etc. The first metro departure time for Line 1, 2, 3 and 4 is 6:00, the last metro departure time for Line 3 and 4 is 23:00, for Line 1 is 23:30, and for Line 2 is 23:50. Taxis in Xi'an are predominantly BYD Auto made in Xi'an. Most, if not all, taxis in Xi'an run on compressed natural gas. For the taxis' fare, during the period of 06:00 through 23:00, ¥9/2 kilometres (1.2 miles) for the fare fall and ¥2.3/km later, at night ¥10 for the fare fall and ¥2.7/km later. There are 6 passenger transport railway stations in Xi'an. Xi'an railway station, located just north of Xi'an walled city, is one of the eight major national railway stations, and the main railway transportation hub of Shaanxi Province. The new Xi'an North railway station, situated a few miles to the north, is the station for the high-speed trains of the Zhengzhou–Xi'an High-Speed Railway. With 34 platforms, it is the largest railway station in Northwest China. Construction of the station began on September 19, 2008. The station was opened on January 11, 2011. As of May 2012, Xi'an North Station is served only by the fast (G-series and D-series) trains running on the Zhengzhou–Xi'an high-speed railway; one of them continues south to Hankou. The city's other stations include Xi'an West, Xi'an East, Xi'an South, Sanmincun, and Fangzhicheng railway stations. Xi'an Railway Station covers 597,000 square metres (6,430,000 square feet), has 5 passenger platforms, and 24 tracks. It provides 112 services to 80 000 people daily. Among the destinations served by direct trains from Xi'an are Beijing, Zhengzhou, Lanzhou, Baoji, and Mount Hua. China Railway High-speed 2 now run an express services from Xi'an to Baoji and Xi'an to Zhengzhou; with a total running time to Baoji of under 90 minutes, and 2 hours to Zhengzhou. The Zhengzhou–Xi'an high-speed railway also serves Xi'an. Construction work began on September 25, 2005, the railway opened for service on February 6, 2010. The railway has made air service between Zhengzhou and Xi'an uncompetitive. All passenger flights between the two cities were suspended within 48 days of start of regular high-speed rail service. Xi'an currently has three ring road systems, the Second Ring road and the Third Ring road which encircle the city. These ring roads are similar to freeways, except where there are traffic signals on the Second Ring road. As a tourist city, Xi'an has built expressways to Lintong, Tongchuan and Baoji, with well-maintained roads to famous scenic spots in suburban counties and to the north slope of the Qin Mountains. Since its construction in September 2007, the G5 Beijing–Kunming Expressway connects Hanzhong and Xi'an through the Qinling. Xi'an Xianyang International Airport (airport code: XIY) is the major airport serving the city and it is the largest airport in the northwestern part of China. It is 41 kilometres (25 mi) northwest of Xi'an city centre, and 13 kilometres (8.1 mi) northeast of the centre of Xianyang. China Eastern Airlines, Hainan Airlines and China Southern Airlines are the main airlines using the airport. Terminal 3 and the second runway were opened on May 3, 2012.
International Routes: There are direct flights from Xi'an to many major cities in Asia, including Bangkok, Busan, Fukuoka, Hong Kong, Kuala Lumpur, Manila, Osaka, Sapporo, Singapore Seoul, and Taipei. First direct route between Xi'an and Europe was launched by Finnair on June 14, 2013. There are 3 three frequencies per week via Helsinki hub to many major cities in Europe during the summer season. United Airlines begun non-stop service to San Francisco since May 2016. Germany's Fraport, the operator of Frankfurt Airport, has paid 490 million yuan to obtain a 24.5 percent stake in the Xianyang International Airport, offering opportunities to upgrade and expand the facility. On June 6, 1994, China Northwest Airlines Flight 2303 broke up in mid-air and crashed near Xi'an, en route to Guangzhou from Xian. A maintenance error was responsible. All 160 people on board died. As of 2016[update], it remains the deadliest airplane crash ever to occur in mainland China. The culture of Xi'an descends from one of the world's earliest civilizations. The Guanzhong Ren (simplified Chinese: 关中人; traditional Chinese: 關中人; pinyin: Guānzhōng rén) culture is considered the cultural antecedent of Xi'anese; their features are satirized as the "Ten Strangenesses of Guanzhong Ren" (simplified Chinese: 关中十大怪; traditional Chinese: 關中十大怪; pinyin: Guānzhōng shí dà guài). Xi'an is also known for the "Eight Great Sights of Chang'an" (simplified Chinese: 长安八景; traditional Chinese: 長安八景; pinyin: Cháng'ān bājǐng), a collection of scenic areas in the region. Xi'an guyue is named for Xi'an. Much like Beijing 1798 and Shanghai 1933, Xi'an has an art district called Textile Town (Chinese: 纺织城; pinyin: Fǎngzhī chéng). The district derives its name from the many textile factories built there since the 1950s. Today it is no longer a centre for the textile industry but a new art factory with 4 workshops in total. Xi'an is home to contemporary Chinese stars such as Xu Wei, Zhang Chu and Zheng Jun. Yangrou paomo (flat bread soaked in lamb soup; simplified Chinese: 羊肉泡馍; traditional Chinese: 羊肉泡饃; pinyin: Yángròu pàomó)  is a well known Xi'anese dish. Qinqiang (Voice of Qin) is the oldest and most extensive of the four major types of Chinese opera. Also called "random pluck" (Chinese: 乱弹; pinyin: Luàntán), Qinqiang is the main type of drama in Shaanxi province. As the earliest ancestor of Peking opera, Yu Opera, Sichuan opera and Hebei Opera[disambiguation needed], Qinqiang has developed its own system of unique vocal music, spoken parts, facial makeup, posture, role, category and acting. It can be traced to Xi Qinqiang (Chinese: 西秦腔; pinyin: Xi qínqiāng; literally: 'Voice of West Qin') in Qin dynasty, and blossomed until Qing dynasty, with direct influences on many branches of Chinese Opera. Zhang Yimou and Gu Changwei are directors from Xi'an. Zhang Yimou is also the only director in China to win the Golden Bear (Berlin Film Festival) twice. The first film is Red Sorghum and the second one is Tuya's Marriage. They are produced by Xi'an Filmmaking Factory (now called Xi'an Qujiang Filmmaking Group) and Xi'an Filmmaking Company, respectively. A pavilion of the City God Temple of Xian. The most influential religions in Xi'an are the Chinese traditional religion and Taoist schools, represented by many major and minor temples. Among these there are a City God Temple, completely reconstructed in the 2010s, and a Temple of Confucius. Chinese Buddhist nuns and laywomen at a temple in Xi'an. Buddhism has a large presence in the city, with temples of the Chinese and Tibetan schools. The first recorded Christian missionary in China was Alopen, a Syriac-speaker, who arrived in Xi'an (then known as Chang'an) in 635 along the Silk Road. The Nestorian Stele, now located in Xi'an's Beilin Museum, is a Tang Chinese stele erected in 781 that documents the 150 years of early Christianity in China following Alopen. It is a 279-centimetre-tall (110-inch) limestone block with text in both Chinese and Syriac describing the existence of Christian communities in several cities in northern China. The Daqin Pagoda, a Buddhist pagoda in Zhouzhi County of Xi'an, has been suggested to have originally been a Nestorian Christian church from the Tang Dynasty. In Xi'an there was formerly a Baptist mission from England. The Baptist missionaries ran a hospital. In 1892, Arthur Gostick Shorrock and Moir Duncan founded the Sianfu Mission, in present-day Xi'an. Xi'an was the first city in China to be introduced to Islam. Emperor Gaozong of the Tang dynasty officially allowed the practice of Islam in AD 651. Xi'an has a large Muslim community, the significant majority are from the Hui group, there are an estimated 50,000 Hui Muslims in Xi'an. There are seven mosques in Xi'an, the best known being the Great Mosque. As part of the China Western Development policy, Xi’an became a major target for accelerated attention. From 1997 to 2006, the industrial output value of Xi’an’s service industry increased at an annual average rate of 13.74 percent, compared to traditional service industries of 0.74 percent, representing a growth from US$8.113 billion to US$25.85 billion. Xi'an is the largest economy of the Shaanxi province, with a GDP of 324.1 billion Yuan in 2010. On average this value increases by 14.5 percent annually, and accounts for approximately 41.8 percent of Shaanxi's total GDP. At least fifty-eight countries have established over 2,560 enterprises in Xian, including nineteen of the Fortune 500 enterprises. These include ABB Group, Mitsubishi, Panasonic, Toshiba, Fujitsu, Coca-Cola, and Boeing. Important industries include equipment manufacturing, tourism, and service outsourcing. The manufacturing industry had an annual output of RMB 36.5 billion, accounting for 44.5 percent of the city's total. Furthermore, as one of China's four ancient capitals, Xi'an's many cultural sites, including the Terracotta Army, the City Wall of Xi'an, and the Famen Temple, make tourism an important industry as well. In 2010, 52 million domestic tourists visited Xi'an, earning a total income of RMB 40.52 billion. On average, revenue increases by 36.4 percent per year, and foreign-exchange earnings (530 million in 2009) increase by around 35.8 percent. Xi'an is also one of the first service outsourcing cities in China, with over 800 corporations in the industry. The city's output value from this sector exceeded RMB 23 billion in 2008. Employment in the sector doubled from 1997–2006, from a base of 60,000, and computer consulting also doubled from 16,000 to 32,000. As a result of the importance of the software-outsourcing industry, the city planned construction of a Software New Town, which is scheduled to be completed in 2015 with 30 billion RMB investment. Other major export goods include lighting equipment and automobile parts, while its major import goods are mechanical and electrical products. Internationally, Xi'an's largest trade partner is the United States. Xi'an is part of the West Triangle Economic Zone, along with Chengdu and Chongqing. a daily average of 3.7 technology enterprises established in Xi'an Hi-Tech Industries Development Zone in the year of 2005, from XINHUANET.com Jul 28, 2005 Xi'an Hi-Tech Industries Development Zone has more than 16,000 enterprises which ranked second place in all the 88 hi-tech ZONES in China, achieved a total revenue of 522.223 billion yuan. It is worth mentioning that 13 enterprise's annual income is over a hundred billion yuan, 19 enterprise's annual income more than 50 billion, more than 265 enterprise earns over billion yuan each year, Listed companies at home and abroad have accumulated 50, of which the domestic A-share market issued 21 of them, accounting for more than 60% of the province; 4 GEM listed companies, ranking first in the Midwest high-tech zones. The growing economy of Xi'an supports the development of a software industry, and the city is a pioneer in software industry in China. The Xi'an Software Park within the Xi'an Hi-Tech Industries Development Zone (XDZ) has attracted over 1,085 corporations and 106,000 employees as of 2012. A Silicon.com article describes Xi'an: "But Xi'an is selling on its own merits—with a large pool of cheap human resources from the 100 universities in the area, it hoovers up around 3,000 computer graduates every year, each earning approximately $120 a month—half the wages for the equivalent job in Beijing." In November 2006, Xi'an and the China Aerospace Science and Technology Corporation jointly set up Xi'an Aerospace Science and Technology Industrial Base. From its establishment, the base has focused on the development of the civil space industry, including equipment manufacturing, software and service outsourcing, new materials and solar photovoltaics. Apart from the core area, the base will cover Xi'an and the Guanzhong area and the expansion zone will reach other parts of Northwest China and Southwest China. It is expected that by 2012 the total industry output can reach 2.8 billion us dollars with about 10 to 20 brand products with intellectual property rights and 5 to 8 products with global competitiveness. In 2008, after the launch of the initial aerospace centre in Shanghai, the PRC is constructing another civil aerospace centre in the Shaanxi province. The State Development and Reform Commission approved the planning of Xi'an National Civil Aerospace Industrial Base on December 26, 2007. The National Civil Aerospace Industrial Base of Xi'an, set to cover 23 km2 (8.9 sq mi), will focus on developing satellites, new materials, energies, IT and other technologies for civil applications. Zhang Chaoyang (张朝阳), the CEO of SOHU (Nasdaq), born and raised in Xi'an, is a prominent leader in the Chinese Internet industry. Liu Chuanzhi, the founder and president of Lenovo Group Limited, completed his tertiary degree from Xidian University in the 1960s. Xi’an was chosen to host the 2011 World Horticultural Exposition by the Association of International Producers of Horticulture (AIPH) at its 59th congress, held in Brighton, United Kingdom on September 4, 2007. The 2011 World Horti-Expo was held from April 28 to October 28, 2011. The exhibition was located in a new district of the city, Chanba district, and was expected to bring some 10 million visitors to Xi’an. The number of travelers is often greater during Summer (May–August), although the most pleasant season for visiting Xi'an is Autumn. Because of the city's many historical monuments and a plethora of ancient ruins and tombs in the vicinity, tourism has been an important component of the local economy, and the Xi'an region is one of the most popular tourist destinations in China. The city has many important historical sites, and some are ongoing archaeological projects, such as the Mausoleum of Qin Shi Huang and his Terracotta Army. There are several burial mounds, tombs of the Zhou dynasty kings located in the city. Xi'an also contains some 800 royal mausoleums and tombs from the Han dynasty, with some of them yielding hundreds of sculpted clay soldiers, and remains of sacrificial temples from the Han era. The city has numerous Tang dynasty pagodas and is noted for its history museum and its stele forest, which is housed in an 11th-century Confucian temple containing large stone tablets from various dynasties. The city is surrounded by a well-preserved city wall which was re-constructed in the 14th century during the early Ming dynasty and was based on the inner imperial palace of Tang dynasty. The Mausoleum of Qin Shi Huang and his Terracotta Army are located 40 km (25 mi) to the east of the city centre, in the city's suburbs. Visitors can take bus 306 to get there from the main train station. The Bell Tower and Drum Tower, both are located at the city's central axis. The city's Muslim Quarter, which is home to the Great Mosque of Xi'an. 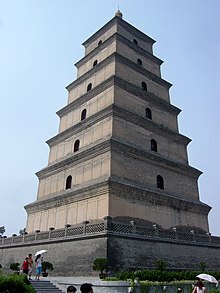 The Giant Wild Goose Pagoda and Small Wild Goose Pagoda are both spectacular towers and both are well over 1,000 years old and have survived great earthquakes. The former is next to a large square with the largest fountain in Asia which projects water high into the air, rising and falling in time to music during one of the daily performances (usually at noon and soon after sunset). They protected Buddhist writings in the past. The Shaanxi History Museum has a large collection of artifacts both modern and ancient. Huaqing Hot Springs, at the foot of Mt. Li, have a history of 6,000 years, the adjacent Huaqing Palace has a history of 3,000 years. Ranked among the Hundred Famous Gardens in China, it also has the status as a National Cultural Relic Protection Unit and a National Key Scenic Area. Xi'an Museum (located next to the Small Wild Goose Pagoda). On October 20, 2006, international council of monuments sites (ICOMOS) international protection centre (IICC) was formally established here. It was improved during the Tang dynasty (618–907). First of all, the feather-stuffed ball was replaced by an air-filled ball with a two-layered hull. Also, two different types of goalposts emerged: One was made by setting up posts with a net between them and the other consisted of just one goal post in the middle of the field. Chang'an was filled with cuju football fields, in the backyards of large mansions, and some were even established in the grounds of the palaces. The level of female cuju teams also improved. Records indicate that once a 17-year-old girl beat a team of army soldiers. Cuju football became popular among the scholars and intellectuals, and if a courtier lacked skill in the game, he could pardon himself by acting as a scorekeeper. Team moved to Guizhou for the 2012 Chinese Super League season. Team moved to Foshan and renamed themselves Foshan Dralions in 2010. Xi'an is also the Chinese Boxing training base for the national team. China Central Television's channel 1 through 12 is broadcast nationwide. Shaanxi Television (SXTV) provincial station, broadcasts on eight channels as well as a satellite channel for other provinces. Xi'an Television (XATV) municipal station, has six channels for specialized programming. Shaanxi Radio broadcasts music, news. Xi'an Music Radio: FM 93.1, broadcasts music, news and talkshows. Shaanxi Music Radio: Fm 98.8, broadcasts music, news and talkshows. Chinese Business View (华商报) is a popular daily newspaper. Xi'an Evening News (Xi'an Wanbao) (西安晚报), with a history of more than 50 years, is one of the oldest newspapers. Sanqin Daily (三秦都市报) covers the news of Shaanxi Province. Shaanxi Daily (陕西日报) covers the news of Shaanxi Province and Xi'an. Xianease is a popular online and print magazine in Xi'an. ^ a b 西安市2015年国民经济和社会发展统计公报. www.xatj.gov.cn/. Archived from the original on June 4, 2016. Retrieved May 12, 2016. ^ "Xi'an". The American Heritage Dictionary of the English Language (5th ed.). Boston: Houghton Mifflin Harcourt. 2014. Retrieved April 14, 2019. ^ "Xi'an". Collins English Dictionary. HarperCollins. Retrieved April 14, 2019. ^ "Xian" (US) and "Xian". Oxford Dictionaries. Oxford University Press. Retrieved April 14, 2019. ^ "Xi'an". Merriam-Webster Dictionary. Retrieved April 14, 2019. ^ "Illuminating China's Provinces, Municipalities and Autonomous Regions". PRC Central Government Official Website. Retrieved May 17, 2014. ^ a b c "Xi'an". Encarta. 1993-2008. September 3, 2008. Archived from the original on February 28, 2008. Retrieved February 6, 2016. ^ a b c d e "Xi'an". Encyclopædia Britannica. Retrieved September 3, 2008. ^ 最新中国城市人口数量排名（根据2010年第六次人口普查）. www.elivecity.cn. 2012. Retrieved May 27, 2014. ^ Du Halde (1736), pp. 220–1; Du Halde (1741), pp. 227–8. ^ Stanford (1917), p. 13 & Index, p. 11. ^ 《中国古今地名大词典》 [The Big Dictionary of Old and Current Chinese Placenames], Shanghai: Shanghai Cishu Chubanshe, 2005, p. 1540 . ^ Yang, Xiaoping (2010). "Climate Change and Desertification with Special Reference to the Cases in China". Changing Climates, Earth Systems and Society. pp. 177–187. doi:10.1007/978-90-481-8716-4_8. ISBN 978-90-481-8715-7. ^ Stark, Miriam T (April 15, 2008). "East Asian plant domestication". Archaeology of Asia. pp. 77–95. ISBN 9781405153034. ^ Fuller, Dorian Q; Qin, Ling; Harvey, Emma (2008). "A Critical Assessment of Early Agriculture in East Asia, with emphasis on Lower Yangzte Rice Domestication" (PDF). Pragdhara: 17–52. ^ Meng, Y; Zhang, HQ; Pan, F; He, ZD; Shao, JL; Ding, Y (2011). "Prevalence of dental caries and tooth wear in a Neolithic population (6700-5600 years BP) from northern China". Archives of Oral Biology. 56 (11): 1424–35. doi:10.1016/j.archoralbio.2011.04.003. PMID 21592462. ^ "Banpo Museum in Xi'an". chinamuseums.com. Archived from the original on January 31, 2018. Retrieved July 29, 2013. ^ "China's six major historical capitals - Xi'an's cultural history". Archived from the original on February 22, 2011. Retrieved February 22, 2011. ^ 中国古今地名大词典 (in Chinese). Shanghai: 上海辞书出版社. 2005. p. 2134. ^ O. Louis Mazzatenta (October 9, 2009). "Emperor Qin's Terracotta Army". National Geographic. ^ "Weiyang Palace: the Largest Palace Ever Built on Earth". Archived from the original on March 3, 2016. Retrieved November 4, 2014. ^ "History of Xi'an" (in Chinese). Archived from the original on February 22, 2011. Retrieved February 22, 2011. ^ Jenkins, Peter (2008). The Lost History of Christianity: the Thousand-Year Golden Age of the Church in the Middle East, Africa, and Asia - and How It Died. New York: Harper Collins. p. 65. ISBN 978-0-06-147280-0. ^ a b Ernest Frank Borst-Smith, Caught in the Chinese Revolution: a record of risks and rescue. London: T. Fisher Unwin, 1912. ^ Edward J. M. Rhoads (2000). Manchus and Han: Ethnic Relations and Political Power in Late Qing and Early Republican China, 1861–1928. University of Washington. p. 190. ISBN 9780295980409. ^ Edward J. M. Rhoads (2000). Manchus and Han: Ethnic Relations and Political Power in Late Qing and Early Republican China, 1861–1928. University of Washington. p. 191. ISBN 9780295980409. ^ "Public Government Policy" (in Chinese). City of Xi'an. Archived from the original on February 22, 2011. Retrieved February 22, 2011. ^ 打砸抢烧不是爱国是害民. 北京青年报 (in Chinese). September 16, 2012. Retrieved September 16, 2012. ^ "Anti-Japan Protests In China Swell, Turn Violent". Huffington Post. September 15, 2012. Retrieved September 17, 2012. ^ a b "Extreme Temperatures Around the World". Retrieved February 21, 2013. ^ 中国气象局 国家气象信息中心 (in Chinese). China Meteorological Administration. June 2011. Archived from the original on July 16, 2009. Retrieved March 17, 2009. ^ a b c 西安人口 [Xi'an population] (in Chinese). City of Xi'an. Archived from the original on March 22, 2007. Retrieved May 16, 2007. ^ 4-5各市、县(市、区)常住人口(2013-2014年)-tjsql.com. www.tjsql.com. June 2018. Archived from the original on December 20, 2016. Retrieved March 6, 2016. ^ 西安市2010年第六次全国人口普查主要数据公报 (in Chinese). Xi'an Evening News (西安晚报). May 25, 2011. Retrieved July 3, 2014. ^ People's Republic of China County-level Division Population Statistics (《中华人民共和国全国分县市人口统计资料2010》). ^ a b c -中国公交信息网. www.bus-info.cn. Retrieved July 3, 2017. ^ 小雪, 翟 (July 4, 2014). 西安机动车数量突破200万辆. 西安晚报. Archived from the original on September 12, 2014. ^ a b 西安地铁二号线开通 西安迈入"地铁时代" [Xi'an Metro line brings Xi'an into the "metro era"]. China National Radio (in Chinese). Beijing. September 16, 2006. ^ "Xi'an Subway Line 2 to begin trial runs on September 28". Global Times. June 29, 2011. Archived from the original on October 16, 2012. ^ 市政府召开西安地铁开通试运营新闻发布会 (in Chinese). September 16, 2011. Archived from the original on November 14, 2011. Retrieved October 3, 2012. ^ "Xian: the Building of Subway to Start This Year". Travel China Guide. September 14, 2006. Archived from the original on January 3, 2014. ^ "Subway Collapse Kills Two in Xi'an". CRIENGLISH.com. China Radio International. August 3, 2009. ^ a b "Growth to continue". Railway Gazette International. DVV Media UK. March 3, 2011. ^ Zhengzhou-Xi'an high-speed train starts operation. China Daily. February 6, 2010 [Retrieved 2010-02-06]. ^ High-speed rail linking central, western China starts operation. iStockAnalyst. February 6, 2010 [archived February 8, 2010; Retrieved 2010-02-06]. ^ High-speed train debuts in W. China. CCTV. February 6, 2010 [Retrieved 2010-02-06]. ^ China express train forces airlines to stop flights. 2010-03-26 [Retrieved 2010-03-28]. Reuters. ^ 陕西年鉴1992 [Shaanxi Yearbook 1992]. Archived from the original on May 29, 2014. ^ News report from the New York Times. ^ "Trouble in Textile Town - Global Times". ^ Xu Wei to rock fans in grand concert. Shenzhen Daily. 2005-07-05 [Retrieved 2014-05-28]. China Daily. ^ 陕西小吃-羊肉泡馍. News.xinhuanet.com. Retrieved May 28, 2014. ^ "Chinese opera The First Emperor transmitted live into theaters worldwide". People's Daily. January 14, 2007. Retrieved November 17, 2010. ^ Yuet Chau, Adam (2006). Miraculous response: doing popular religion in contemporary China. Stanford University Press. p. 53. ISBN 9780804767651. Retrieved November 17, 2010. ^ Shorrock, Arthur Gostick (1926). Shensi in Sunshine and Shade. Shanghai: Presbyterian Mission Press. ^ "Duncan Papers (Mundus Gateway to missionary collections in the United Kingdom)". Angus Library, Regents Park College. ^ Burt, Ernest Whitby (1925). Fifty Years in China: The Story of the Baptist Mission in Shantung, Shansi, and Shensi, 1875-1925. London: The Carey Press. ^ Glover, Richard (1914). Herbert Stanley Jenkins, medical missionary, Shensi, China: with some notices of the work of the Baptist Missionary Society in that country (1914). London: Carey Press. p. 155. ISBN 978-0-524-07100-7. ^ Duncan, Moir Black (1900). The missionary mail to faithful friends and candid critics (the substance of letters written from Shên His). London: Elliot Stock. ^ Zhang, Zhizhong. 中国七大中心城市人口资源大调查 [Population survey of the seven central cities of China]. National Family Planning Commission. ^ a b c Walcott, Susan (April 17, 2010). "Xi'an's Maturing Economy". Retrieved June 1, 2013. ^ a b c d e "Xi'an ( Shaanxi ) City Information". August 29, 2011. Retrieved June 1, 2013. ^ "City Report: Xi'an". January 17, 2007. Retrieved June 2, 2013. ^ "Xi'an Economy". The People's Government of Shaanxi. January 1, 2008. Archived from the original on March 3, 2016. Retrieved June 2, 2013. ^ "Xi'an". Lehman, Lee & Xu. Retrieved June 2, 2013. ^ "Xi'an software park". www.xdz.com. Retrieved February 10, 2018. ^ a b c "Xi'an". The Columbia Encyclopedia, Sixth Edition. Archived from the original on June 6, 2011. Retrieved September 3, 2008. ^ "Sister Cities of Kyoto City". City of Kyoto. Archived from the original on January 21, 2014. Retrieved January 21, 2014. ^ "List of Twin Towns in the Ruhr District" (PDF). Twins2010.com. Archived from the original (PDF) on November 28, 2009. Retrieved October 28, 2009. ^ "SISTER CITY PARTNERSHIP OFFICIALLY FORMALIZED BETWEEN PENANG, MALAYSIA AND XI'AN, SHAANXI PROVINCE, CHINA". SEIA. October 27, 2014. Retrieved March 6, 2017. Du Halde, Jean-Baptiste (1741), Brookes, Richard (ed. ), The General History of China, 3rd ed., London: J. Watts . Heng Chye Kiang (1999), Cities of Aristocrats and Bureaucrats: The Development of Medieval Chinese Cityscapes, Singapore: Singapore University Press, ISBN 978-9971-69-223-0 . Stanford, Edward (1917), Complete Atlas of China, 2nd ed., London: China Inland Mission . Woo, J.K. (1964), "A Newly Discovered Mandible of the Sinanthropus Type: Sinanthropus Lantianensis", Scientia Sinica, Vol. 13: 801–811, PMID 14170540 . Wikimedia Commons has media related to Xi'an. Wikivoyage has a travel guide for Xi'an. This page was last edited on 24 April 2019, at 18:31 (UTC).